Katherine Tegen Books, 9780062391834, 304pp. 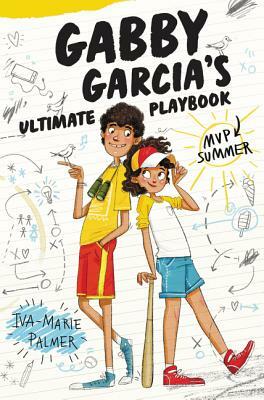 Everyone’s favorite pitcher Gabby Garcia is back and better than ever in the second installment of this laugh-out-loud illustrated middle grade series full of doodles, sports trivia, and home-run humor! Summer is here, and pitching phenom Gabby Garcia has another hot streak all planned out! After she’s invited to join an elite baseball league and asked out by her crush, it seems like Gabby is bound to achieve her MVP dreams. But life loves throwing Gabby curveballs. And when her BFF Diego returns from Costa Rica with a totally oddball new hobby, it feels like their once solid friendship is suddenly biting the dust. Thank goodness Gabby has her playbook! Iva-Marie Palmer is the author of the books in the Gabby Garcia's Ultimate Playbook series. A former journalist who oversubscribes to periodicals, she loves books, running, cooking and eating elaborate meals, classic screwball comedies, food sold off carts and trucks, old movie palaces, word games and crossword puzzles, adventures large and small, indulging her curiosity and overextending herself. She lives with her husband, two sons, and a seeming inability to take her sunglasses off her head when indoors.